The great thing about PUBG Mobile is that it offers a wide range of content within the game. Apart from killing some people to grab that chicken dinner, one of the most popular features is the variety of apparel and accessories that you can use to style your character. Sure, some of them are not free and you really need to pay the money when it's fun to show special clothes and skins when you play games. In the festival of Diwali last year, the game introduced a special Kurta Pajama set, which targeted Indian audiences. Now there is something new that can tempt you, especially if you like cricket. 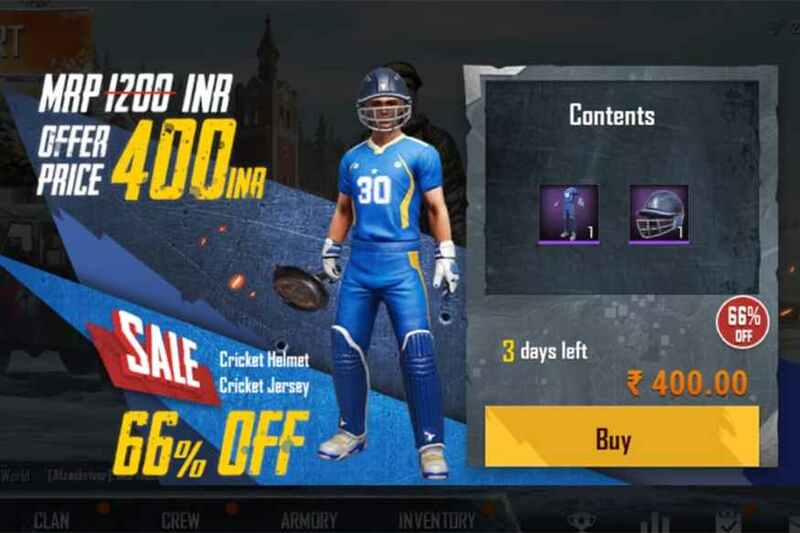 If you go to the event box at the bottom right of the home screen page, then the first option is a new cricket jersey with the cricket helmet. At present, it is worth 400 rupees, which is obviously after 66 percent discount. Clothes sets will only be available for a limited time, so if you want a unique form when running PUBG mobile, you should grab it quickly. Yesterday we heard that the PUBG Mobile India series tournament has received 575,000 registrations, which is a polite number for the mobile Esports tournament in India. This proves lucrative enthusiasm for PUBG mobile broad support and gameplay. To register, players can sign up to where the PUBG Mobile India Series 2019 registration page needs to go. Once you register, you can either join a squad by entering a squid ID or create your own squad and invite your friends. The tournament will consist of two qualifying rounds followed by the Grand Finale. All games will be held in the third person mode in the Asia server area.